The people at Bien Fait Specialty Cakes graciously sent me two of their cakes to review. 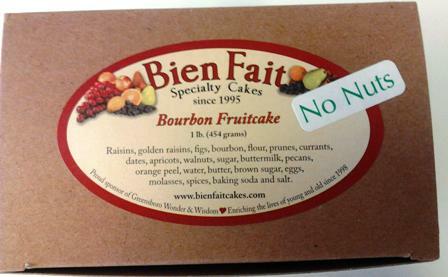 Because I've had inquiries about cakes that don't contain nuts, I asked for their bourbon fruitcake without nuts. They also said that their Golden Jewel cake is fairly well known, so sent that one along. Both cakes are $15.00 for a one pound cake, and shipping to my location runs about $11.70 ($8.50 for one cake). Another thing I really appreciate: both cakes were packed with a plastic bag and tie. Mary of Puddin Hill does the same thing, and I really like it--they have already anticipated your need to pack up the cake for future eating, and are helping you make sure that your cake stays fresh. Yes, a lot of raisins, and also molasses, which often translates to a burnt, raisiny taste that I'm not particularly fond of, but that was not the case here. The fruit was all good quality, not dry or too sweet. There was a good cake-to-fruit ratio here, with the fruit well distributed throughout the cake. There was a bit of that quick-bread type quality due to the dried fruit and general lighter taste. However, because of the light aura of bourbon wafting throughout the cake, this one still tastes more like a fruitcake and less like a date nut bread, for example. Figs are a funny fruit--if you've ever eaten a Fig Newton you'll recognize the funny texture that the seeds give to anything they're in, and the same is the case here--so if you don't like figs, don't get this cake. This cake resembles, in many ways, its Vermont neighbor, the Old Cavendish cake, except that unlike that cake, it contains booze. 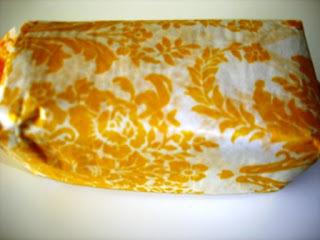 But they both use dried rather than candied fruit, and both have a fresh, quick-bread type flavor. This one leans more towards a traditional fruitcake taste, with the inclusion of the booze, and I like the no-nut option. I may need to create a new category, eh? That "Other" category is getting long and heavily weighted with cakes that use dried rather than candied/preserved fruit. Maybe "Modern"? "Lighter-tasting?" 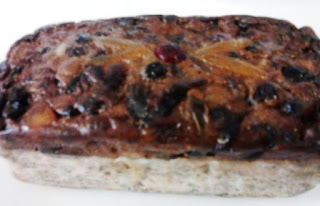 "Dried fruit cakes" (though that doesn't sound tasty)? Suggestions welcome--please comment. Yah mon! Definitely more tropical. When I first unwrapped it, it looked similar to the Robert Lambert white cake, albeit a lower budget one. 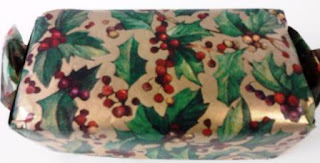 And I would say if I had to draw a similarity, it would be to that cake, or even to the Swiss Colony Macadamia Nut cake. All three share a vaguely similar pound-cake like batter. I must warn you that if you don't like the texture of coconut, don't get this cake. The shredded coconut gives a rich but also slightly hairy texture to the cake. And yes, this is absolutely tropical tasting. Between the pineapple and the coconut, as well as the rum, you get a bit of a piña colada or maybe even ambrosia-like flavor. The apricots really make their presence known as well, and I found the cranberries to add a refreshing tartness that I would have liked a bit more of. 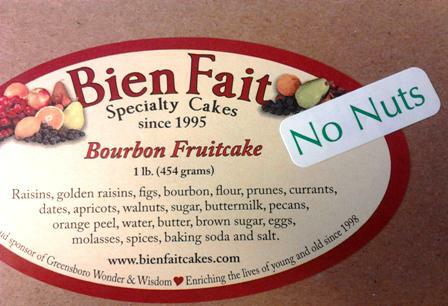 So is it really a fruitcake? Well, there's fruit and booze in it, so yes, I guess so, but it's definitely non-traditional. Ah-HA! Maybe I have a new category name right there! By the way, the profits from the sale of these cakes support Wonder and Wisdom, a non-profit in Greensboro that conducts social and cultural enrichment programming. Do you booze-up your store bought cake?